You may be able to bring spectators depending on your chosen experience. Whether you fancy tearing around a track in a Ferrari or being driven around a rally track by a professional this voucher gives you the opportunity to choose 1 from 21 fun driving experiences. This quirky looking car may not look like a typical speed machine, but it’s certainly earned its reputation among motoring fans who appreciate the minimalist design and incredible acceleration. Most drivers never get to feel the power of G-force, pushing them into their seats as they press their foot on the accelerator, but this 3 mile drive will deliver in spades. Please note, there is a £25 supplement charge payable for bookings at the Blyton Park venue. This experience is available on selected Monday to Friday dates, throughout the year. You will drive 3 miles, please allow for approximately 2 hours at the venue. Drivers must be fit and healthy and not suffer from any conditions that may impact their ability to drive the car safely. The maximum weight is 20st (127kg) and the minimum height is 135cm (4ft 5"). You will be required to hold a full UK or European manual driving licence and this will need to be presented on the day. This is an experience to drive some of the most impressive cars around, from TV stars such as the General Lee and Iron Man’s Audi R8, to timeless classics such as an Aston Martin, Nissan GTR, Ferrari 348 TS or a Pontiac Firebird. 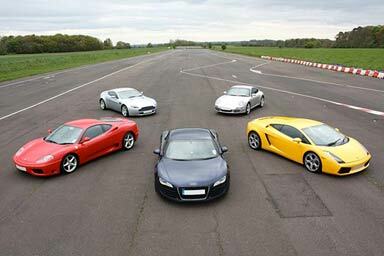 With this experience you will get to drive 3 miles in a choice of amazing cars. There is something for everyone, from speed demons to fans of elegant engineering and those who are star struck by their favourite cars from the silver screen. Ferrari have achieved another triumph with this car and this incredible vehicle really is the pinnacle of engineering. This model was designed by Enzo Ferrari before his death as a lasting reminder of his genius. Taking this motoring masterpiece out for a 3 mile spin is sure to be the high point of anyone’s driving career. Who wouldn’t want to drive the same car as Iron Man? This amazing motor combines speed and strength in much the same way Tony Stark does, to make a supercar fit for a superhero. This R8 has everything anyone could want in a car and with an instructor to help get the most out of it on this 3 lap sprint, it’s sure to impress. Mad Max certainly demonstrates why off-roading is one of the most exciting driving experiences, and this is an opportunity to tackle some of the toughest obstacles for a truly white-knuckle drive. This gravity-defying course may seem insurmountable, but with expert guidance anything is possible. You will drive for approximately 20 minutes, please allow for 1 hour at the venue. With Ford’s long history of vehicle design and manufacture, it’s no surprise that their latest offering is considered by some to be the ultimate muscle car. With only 4 of these much sought-after cars in the country, 3 miles in the Roush is a truly unique experience. The Fast and Furious franchise has showcased a lot of incredible cars, and the Nissan Skyline is an example of just what advanced electronics can do to a car. 675BHP might sound like a lot of power to have under the bonnet, but actually feeling it in action during 3 miles of the track is enough to take your breath away. This car shot to fame in The Fast and Furious films, but it’s got more to offer than just hair-raising speeds. Incredible handling, awesome acceleration and state of the art technology to name a few. A 3 mile drive in this incredible car, with its 400 BHP, will whizz past - literally! This car is a triumph of engineering and elegance and its sleek lines are instantly recognisable as the car that was instrumental in helping James Bond to capture some of the silver screen’s most notorious baddies. 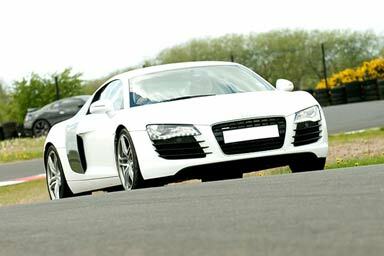 Take to the track for the most stylish 3 mile drive going - this is the kind of car that makes people fall in love. This car may not transform into a crime-fighting robot, but it has a lot to offer nonetheless. As the fastest Camaro ever built, there is plenty to impress fans of muscle cars. Taking this amazing car around the track for 3 miles is an experience not to be missed, and a little guidance from an expert instructor will see drivers reaching white-knuckle speeds. Quad Biking is the perfect way to get outdoors, sample the different types of terrain the world has to offer and see how much these machines can really handle. Powerful, easy to handle and great fun to ride, even if you’re a complete novice you’ll soon be riding down forest tracks like a seasoned professional, thanks to expert instructors. Your day will begin with a full safety briefing, followed by getting to grips with the vehicle’s controls and learning the riding techniques necessary to give you the most from your experience. The location you will attend boasts 70+ acres of woodland split into 2 separate circuits, easy and hard. The easy session will see you mastering the basics, taking on the open woodland and cutting between and behind any trees/obstacles that get in your way. Once mastered and ready, you will be taken onto the harder circuit which consists of navigation between some very tight trees (the wheels just fit), up and down steep hills and through some very boggy and muddy sections for 30 fun minutes! This experience lasts approximately 30 minutes, with approximately 20 minutes driving time. The maximum weight for this experience is 114kg (18st). Any couple who like to share a little excitement will appreciate the chance to get their hearts racing with this off roading experience. Being in a Land Rover while it is performing some of the most impressive feats of motoring will have both participants clinging to their seats, the ceiling and anything else they can get their hands on as the 4 x 4 takes on gravity and emerges victorious. This is a track day with a difference that starts with a welcome from your qualified instructor and a chance to learn more about the apparently everyday vehicles that can achieve such amazing feats when given the opportunity. Then it’s time to get into the car and find out first-hand what it is like to see nothing by sky through the windscreen, swiftly followed by the sight of the bottom of a ditch as the driver takes on a course which features a range of specially designed obstacles including steep inclines and a series of ‘axle twister’ which will see the vehicle tilting at angles that appear to be impossible. This experience is suitable for adrenaline junkies of all ages, whether they are experienced motorists who will get a kick from doing something completely different or a younger enthusiast who wants to find out just what a 4 x 4 can do with an expert behind the wheel. This experience is available on selected weekend dates, from April to September. This experience will last approximately 30 minutes, with 15 minutes driving time. There is no minimum age, you must be at least 1m in height. This experience is not suitable for those with heart conditions, back problems or if you’re pregnant. The maximum weight is 139.7kg (22st) per person. You're welcome to bring friends and family to watch! For some good fun that’s anything but clean, there’s nothing quite like churning up the mud with a quad bike. These nifty vehicles can take on even the most challenging terrain, defying gravity in the way that only a 4 x 4 can and providing riders with a uniquely exciting experience as they test their nerve against the obstacles they come up against. This is the perfect experience for an outdoor adventurer who enjoys the adrenaline rush of taking on a challenge and conquering their fears as they tackle the specially-designed woodland safari course. The day starts with a welcome and a safety briefing which will ensure that each rider is confident about what to expect from their quad bike. Protective clothing is provided and once the rider is kitted up they will be shown to their quad bike and the instructor will talk them through the controls. Then it’s on to the practice course, a level track which is perfect for getting used to the quad bikes controls in a safe environment. After a few laps of this course, it’s time to take on the challenge of the safari course, a purpose-designed track which takes riders through the beautiful three-acre woodland and provides participants with the chance to take on some challenging and exciting terrain. This experience is available on selected weekday dates, from March to December. The minimum age is 14 years old. This experience is not suitable for those with heart conditions, back problems or if you’re pregnant. The minimum height is 1.52m (5ft). On arrival at the track you will be given your specialist racing clothing and a safety briefing, then it's time to get going. Whether you are a first timer or an experienced kart racer the opened timed racing session is the ideal opportunity to develop your skills, with approximately 30 minutes driving time you can take the track at the speed that best suits you. A lap time report at the end tells you how well you've driven! This experience will last between 25 to 30 minutes. The minimum age for this activity is 16 years old. There will be other drivers there on the day. This experience is perfect for those who are new to rallying and want to get a taste of exactly what it has to offer. Experience the amazing power, traction and control of these awesome rally cars as you navigate your way through the challenging rally stage. You’ll start with a general welcome, introduction and safety briefing, before taking to the track in a Subaru WRX or equivalent. Under the guidance of an experienced rally instructor, you'll learn new and unique driving skills, including skid control, brake control, under-steer and over-steer techniques. The experience will end with a debrief and a driving certificate to keep as a memento of your day. This experience is available on selected weekdays throughout the year, weekends are available at an extra cost. The drive will last approximately 5 minutes, you will be at the venue approximately 45 minutes. The minimum height for this experience is 1.52m (5ft) and the maximum height is 1.95m (6ft 4"). The maximum weight is 114kg (18 stone).